Alcoholic hepatitis – is a dangerous inflammatory disease, which strikes the liver. As a rule, it appears against the background of long-term consumption of alcohol. Probably, many readers want to get know what it means a long-term consumption. The situation can be illustrated by such example: a human drinks 100 g of absolute alcohol (or more amount of alcoholic drinks on conversion to absolute alcohol) every day during five years. There is 100 % probability that such human will get alcoholic hepatitis, bringing considerable damage to health. synthesizes hormones, which take a part in digestion. It is difficult to go wrong, calling a liver as an organ, which has a primary importance for organism functioning. A liver plays a role of filter, reservoir for blood and glycogen, produces necessary hormones and converts different substrates into glycol. Naturally, damaged or unhealthy liver will not be able to do its work as effectively as it was defined for her by nature. Alcoholic hepatitis has also a number of other titles, the most known from which is steatohepatitis or fatty liver. We are talking about that the functioning cells of liver, which were damaged as a result of the constant alcohol consumption, without recovering, die. Organism replaces dead areas of tissue with the fat tissue. Thus, the functioning liver area reduces that also influences negatively on that what workload can be done by this organ. Though the alcoholism consequences for liver are terrible, there are a few of alcoholics who can stop to drink because of the described effect. Safe alcohol doze, to consumption of which doesn’t bring to regeneration of liver cells, ia about 40 grams per day for men and twenty grams of alcohol for women. Good to know that standard glass of vodka (50g) contains 20 g of alcohol. Thus, having drunk 100 g of vodka, a man is getting tat doze of alcohol, which conditionally can be considered as safely. The danger of vodka and other similar drinks is that the men and women, who decide to daff at bottle with friends, are rarely limited by the prescribed safely doze of alcohol. patients, the weight of body which exceeds much the rate of growth overall weight indicators. It often happens that viral hepatitis doesn’t show itself during early stages of disease, signaling about its presence only when a patient already has serious problems with the health. constant increase of body temperature to 37 degrees. In such cases, as a rule, biochemical blood tests are made. With positive result – is the analysis on organ biopsy. A sample of liver tissue helps to specify the actual condition of organ and to determine inflammatory foci in liver cells. Herewith the state of the hepatocytes death – liver cells is determined. Laboratory marker of alcohol consumption not always helps in search of the exact answer for confirmation of the diagnosis. Its significance is raised by combination of several tests, which also are called the profile of alcohol. The total mass of the liver is formed on 60-80% from hepatocytes. Getting into the body, alcoholic drinks, damage the liver parenchyma, thereby limiting the functions of the body. It influences on liver work and on the whole organism. Alcohol is considered to be the most dangerous poison for organism. 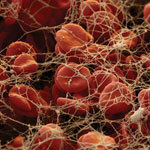 Blood quickly carries it throughout the body, including that its poisons are getting into liver, heart and brain. All changes in work and structure of liver are logical and pronounced at patients with active expressed alcoholic hepatitis. At such patients mortality is caused predominantly by complications of cirrhosis. That is why diagnostic and terms of disease detection and also the value of its symptoms are very important. As it has been said above, hepatocytes – are liver cells, which are the basic functional unit of the body. Well known that 60-80% of hepatocytes form the total weight of the liver. Alcohol, getting into the organism, damages the liver’s parenchyma, limiting organ’s functioning. It should be noticed that parenchyma of any organ – is a complex of cells, the union of which provides normal functioning of this or that organ, in a certain system of the organism. Thus, damaged integrity of the functional liver components (its parenchyma) is a reason of interruptions in work not only of the liver but of the whole organism. Alcohol is one of the most dangerous poisons for a human due to the fact that getting into the blood it begins to spread immediately with its flow throughout the body. 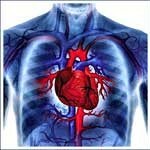 It means that almost immediately it reaches liver, heart, brain and other essential for the life support organs. Special enzymes are produced in liver, which begin to split alcohol into substances, which are more harmful for organism than an alcohol. However, this cycle of alcohol splitting in a human body doesn’t end. Naturally, human body can’t allow the poison substance to walk around circulatory system, which much more harmful than alcohol itself. That is why alcohol splitting in a liver has a place till non-toxic substances begin to form, which may be removed together with urine. As it seen, the main hit on “elaboration” of alcohol, getting into organism, has a liver, which, as a rule, sufferers more than other organs. It would seem what terrible that the liver successfully splits an alcohol? The fact is that, in alcoholic’s organism this process occurs in some different way. A set of necessary enzymes simply doesn’t have time to be renewed during regular alcohol consumption. It is fraught with so-called deficit of enzymes, and also by the fact that recycled materials don’t leave the ranges of liver. In this manner an alcoholic hepatitis develops at alcoholic, and this hepatitis is usually accompanied with all of the above unpleasant symptoms. Some period of time a liver is able to work to the point of exhausting, using internal resources, but soon a cirrhosis begin to develop, and also a condition, which is called hepatic failure. the chronic stage of the diseases. The first form of hepatitis develops fast, roughly and brings much discomfort and powerful negative impact on a body. The second form – is sluggish, but constantly bringing inconveniences and uncomfortable soreness. Besides, during acute alcoholic hepatitis the pain in area of liver surely occurs, which disturb the patient constantly. Sometimes it happens that the flow of bile from the liver is broken, which leads to the fact that the nature of the disease becomes cholecystic. Statistic says that refusing from alcohol consumption, approximately 20% patients can throw off an illness. Continuing to drink, most of alcoholics are getting cirrhosis. slight yellowness of a patient’s mucosa and skin. If a patient has found these symptoms, then he surely needs to ask the help from specialist, who can diagnose well and to prescribe treatment. Besides, it is important that parallel a patient being treated from alcohol dependence, because therapies, directing to treatment of a liver, don’t have a meaning, if not to resolve this issue, which provokes inflammatory process. severe stage, when the cirrhosis has almost developed. Naturally, the earlier a problem is diagnosed, the more a chances to recover completely. If we are talking about severe stage of this disease, then doctors, as a rule, can’t provide almost any guarantees to a patient. One of the often observable alcoholic psychoses – is an alcoholic delirium, which is known among the people as delirium tremens. As a rule, its attacks come out during the first 3-6 days after an alcoholic has stopped drinking. It occurs during the second or he third stage of alcoholism, that corresponds to medium-term development of alcoholic hepatitis. Expected consequences – are disappointing: hepatitis with time turns into cirrhosis. Severity of illness is traditionally compared with malignant tumor. That is why not rare the cases when alcoholics need oncologist’s help. The second alcoholic’s “companion” is ascites, the predecessor of which is often hepatitis. A characteristic external sign is overly enlarged abdomen. This is because the liquid begins to be accumulated in abdominal. The kinds of ascites are determined by accumulated liquid. Small. Amount of liquid is not more than 3 liters. It can be spotted with the help of ultrasound or laparoscopy. Medium. Increased amount of liquid changes the shape of abdomen. On this stage the movements of diaphragm aren’t obstructed yet. Big: there are accumulated about two-three dickers of liquid in a stomach. Stomach interferes with movements; the problems with diaphragm’s movement are felt. Ascites – is a organism alarm, that a liver can’t filter the blood any more, its liquid components are separated and accumulated in an abdomen. This moment can’t be missed: it is stayed for a patient for about five years to sum up life. Pathological disorders in liver work, as a rule, limit the life by this period. That is why the struggle with alcoholic hepatitis, according to doctors, should be accompanied by compulsory treatment. Alcoholic hepatitis, as an alcoholic fibrosis, is considered as sad harbinger of an initial stage of cirrhosis. Doctors divide the illness into acute alcoholic hepatitis d chronical, considering them separately. incurred because of the metabolic disorders. combination of prednisolone with azathioprine. 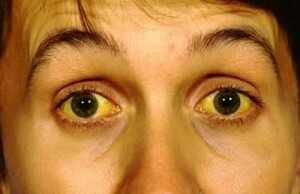 Toxic hepatitis can be formed as a result of influence of the several drug groups. In base of treatment – is a task: to determine and cancel the drugs and preparations, which has caused a chronical illness. In most of cases this way allows to stabilize the process and even to cure a patient. 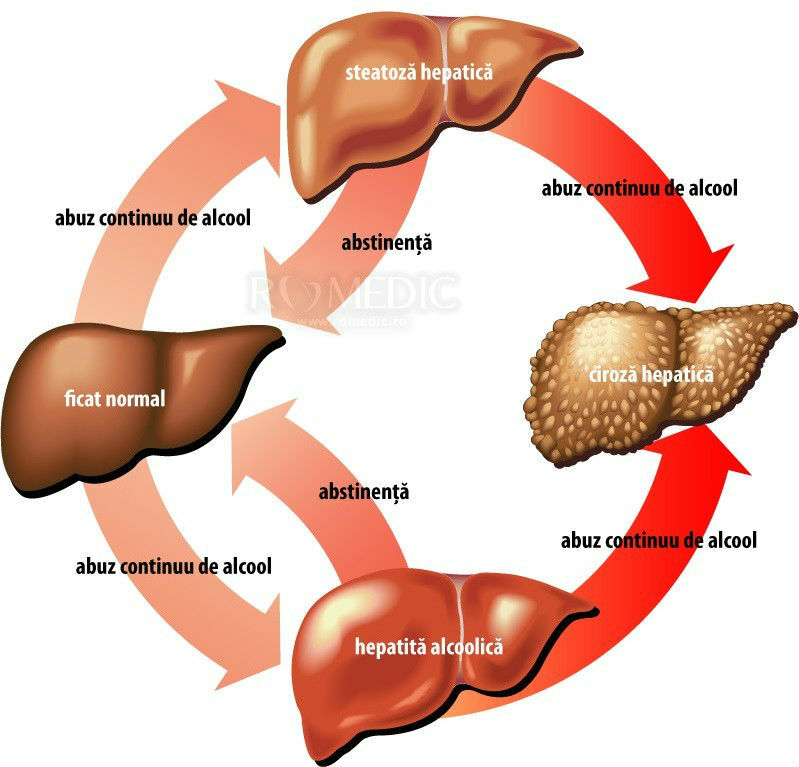 Alcoholic hepatitis is characterized by chronical defeat of a liver from toxic impact of ethanol on a liver. 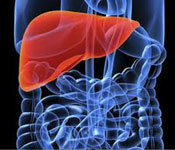 Steatohepatitis – is a phenomenon, which is observed in liver tissue, occurs with varying degrees of severity. Changes have irreversible character. If a patient will not stop drinking, hepatitis transforms fast into cirrhosis. Persistent form is rather stable. During which there is a chance for positive answer for a question, is it possible to cure a patient and how. That means that there is a chance for inflammatory process reversibility, and wherein an alcoholic should want himself to cure and stop drinking. Progressive form means micro focal of liver, which ends often with cirrhosis. It determined that probability of development of cirrhosis is about 15-20%. 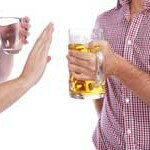 Using modern standards of treatment from alcoholism, a doctor can stabilizes inflammatory processes and save residual. 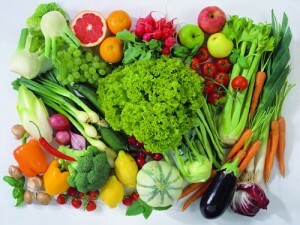 to take medicines and preparations for maintenance and restoration of the liver. ignore recommendations, given by a doctor. A doctor determines to treat outpatient or in hospital according to severity of disease. Nothing – nor modern treatment, methods will help, if a patient do not refuse from alcohol. from sweet deserts it is better to eat zephyr, paste, jujube and also different not chocolate candies. It is necessary to exclude from a diet all food, which have irritant action on a liver: chocolate, coffee, spices, fat and salty. Besides, it is better to bake, boil and steam the food. 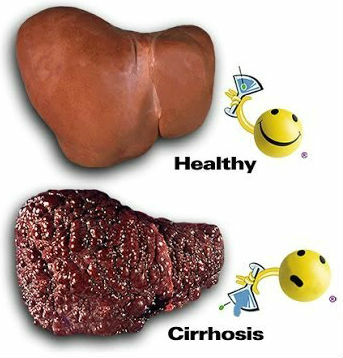 Liver of every tenth alcoholic suffers from cirrhosis. Alcoholic cirrhosis, as a rule, develops slowly, but forecast is much better than during others diseases. The first man, who has pointed to link of it with alcohol, was M.Baillie at the end of XVIII age. Later a formulation appeared, pointing, that liver alcoholic hepatitis can contribute the development of disease. brittle bones, glums bleeding and slow healing of wounds. resizing of the parotid glands. Alcoholics are betrayed by the profusion of spider veins of the top torso skin, reddened palms and abdominal distention. Cirrhosis is accompanied with mental disorder, delirium and sleep disorders. Specialists make a prognosis based on datum about disease duration and patient’s punctuality in observance of doctor’s instructions. The required condition is full refusing from alcoholic drinks. If a patient suffers from cirrhosis more than five years, only every second has a chance for recovering. Others leave this life: stiff sentence for the habit.